Please take note of these forecasts if you live in the Southeast. 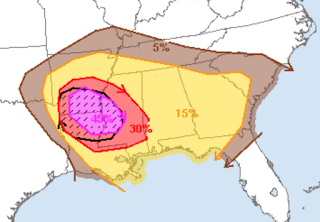 The brown area has a significant risk of tornadoes between now and sunrise Sunday. There is an enhanced risk in the 10% (yellow) areas. 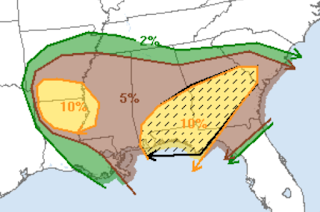 The hatched area, which has been extended into South Carolina, has a risk of violent tornadoes. On this map, the significant threshold for >1" hail is 15% (yellow). There is a very high probability of 45% in parts of Mississippi, Arkansas and Louisiana. Where you see the hatching, the hail is forecast to be larger than 2" in diameter.